When we think of raviolis, our mind often goes to round gluten-laden pillow puffs filled dairy-based fillings first. 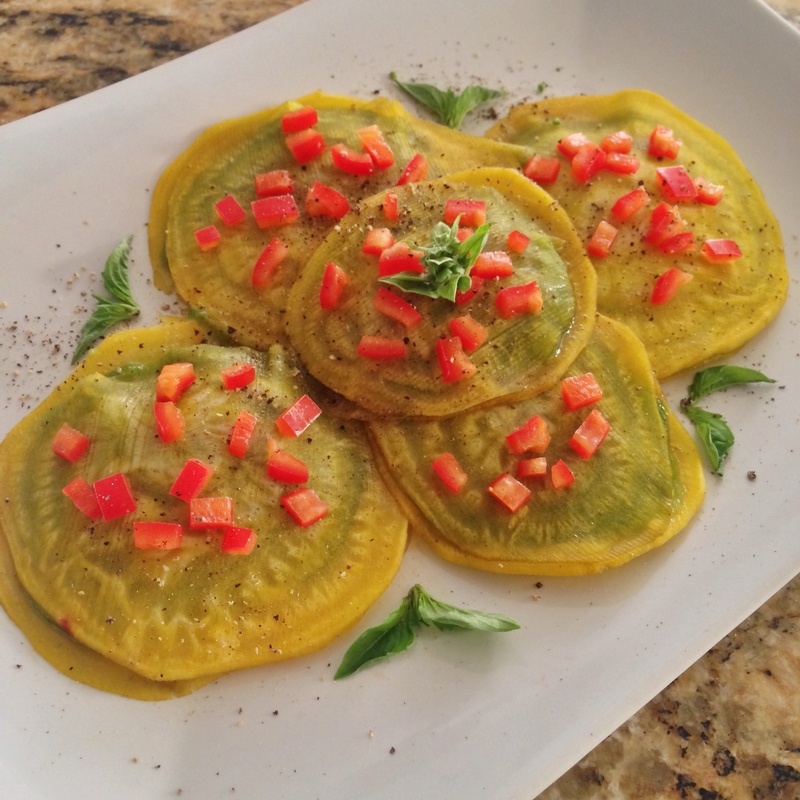 They are delicious, of course, but for those with allergies or those simply taking charge of their health and wishing to stick to a living, plant based lifestyle, traditional ravioli dishes are no longer an option. Until now! Meet my Rockin’ Raw-violi – the all natural vitamin filled, super tasty, LIVING dish that does what no traditional pasta can! It’s high in fiber, folate, vitamins A, B, C, K, B-6 and an excellent source of all natural energy. Although they look a lot like nutrient-dense pasta, these raw-violis will give you all the flavor the you want but without the gut bloat and caloric guilt! Place the ½ cup of olive oil, cashews, spinach, basil and garlic and sea salt, in that order, inside the blender and mix until smooth and creamy. Pour into a small bowl and set aside with a spoon. Wash and peel your beet. Then, using the mandoline, carefully slice your beet into thin slices. Each slice should be thin enough to bend but thick enough not to break. Spilt your beet slices into groups of two, placing a dollop of the cashew / spinach filling in the center of half of the slices. With the remaining beet slices, dip your finger in the ¼ cup of olive oil and make a circle on the outer edge of each. Take these oiled slices and place them on top of the cashew / spinach filling covered beets and press to seal the edges. Place on your plate and sprinkle the red pepper and basil tips along the tops of the raw-violis with a small drizzle of the remaining olive oil and enjoy! For more raw recipes and videos of my tutorials, Check out Living Health Magazine and subscribe today! Previous post Shake It Bay-Bee Shake It!